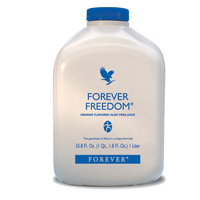 Forever Freedom combines Aloe Vera with two natural elements that are part of the joints, and help maintain its function and mobility: glucosamine sulfate and chondroitin sulfate; in a formula with delicious orange flavor. To this, we have added vitamin C and MSM, a primary source of bio-available sulfate that the body needs to maintain healthy connective tissues and joint function. It contains seafood.